The con is on: Ensemble of American Hustle. Image courtesy of Columbia Pictures. The art of survival is a story that never ends. These are the last words of American Hustle, and they echoed in my head long after I left the theatre. As an avowed word nerd, I was impressed that the whole plot of a film could be summed up so succinctly and with such elegance. It should be noted that director David Owen Russell also directed 2012’s Silver Linings Playbook, which I LOVED. I also love movies made and based in the 70s – that era of American history holds a certain draw for me, so the bar was set pretty high right from the get-go. What strikes me about Russell’s directing style is his knack for showing life as it is happening. He winds up the plot and lets the actors take it away. 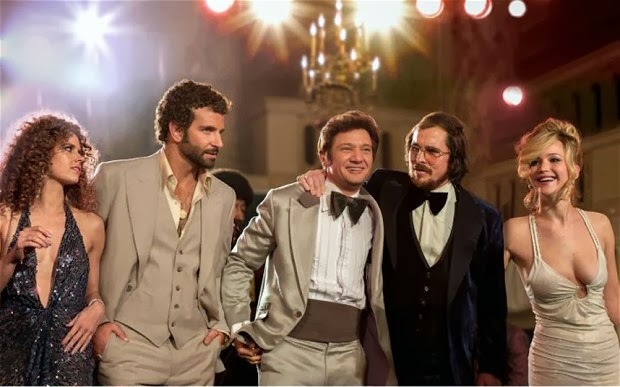 He chooses his actors carefully and gives them the creative space to make their characters come to life, to slip into their respective skins, which is the point of American Hustle – how people create images, caricatures of themselves in order to survive. The actors are being actors of the characters they are acting. (Try saying that five times fast). Christian Bale as head con man Irving Rosenfeld gives the performance of a lifetime. Almost unrecognizable with a paunch and a comb over, he drives the plot and owns the storyline with all the languorous reluctance of a king who doesn’t want the throne he's placed on. Amy Adams as his business partner and lover Sydney Prosser acts as his perfect foil, a hard-charging, fiery beauty masked under wide blue eyes and a sweet smile who eschews conventional society as easily as she does her bra. Stirring the pot is the ever-versatile Jennifer Lawrence as Irving’s unstable wife Rosalyn, and Bradley Cooper as Richie DiMaso, an unhinged FBI agent who finds an opportunity to force Irving and Sydney to use their dubious talents to uncover a crime ring in New Jersey. This also includes deceiving the mayor of New Jersey, Carmine Polito, who is played with understated panache by Jeremy Renner. What quickly escalates is a power play of wills, and the stakes become increasingly higher as the con gets underway. There's also an excellent cameo of one of my favorite actors (I won't say who, don't want to ruin the surprise) and a very welcome appearance of Jack Huston as a mobster, whom I'm well acquainted with as Richard Harrow on Boardwalk Empire. Pounding in the background behind all of this is an excellent selection of 70s hits, including “Delilah” by Tom Jones and “Long Black Road” by Electric Light Orchestra. Throw in a score composed by Danny Elfman and you’ve got a pretty bangin’ soundtrack. However, there are times when I wished Russell had opted to turn down the booming tunes and turn up the dialogue. Watching Rosalyn with her ever-present crazy updo furiously cleaning her house while singing along to “Live and Let Die” struck me as vaguely ridiculous, and didn’t add that much to the film overall. It is the inspired ordinary moments amid the glitz and glamour that make the film worth a second view - love blossoming in the mundane as clothes on dry cleaning racks swirl around, the simple joy of walking down the street hand in hand. Camera angles dip and whirl to create their own statements. In one memorable moment we view Richie's frantic movements through the flashing lights of a disco club so they appear stilted and slow. This deftly shows rather than tells the paradox of heightened passion and slow motion effectively trapping Richie in his own mental anguish of wanting to move forward but never getting ahead. All of this leaves the audience wondering - what does it take to survive? And is it possible to make an art out of doing so? If American Hustle gives any indication, than the answer is yes. Toby sez: Solid storytelling, acting, and execution that leaves one coming back for more. I enjoyed it thought it was much better than Wolf of Wall Street, which I feel fall in the recent vein of movies, bad men doing some shady money stuffs with a retro soundtrack. Was it the best movie of the year? I'm not convinced just yet. I think that's a fair assessment. I'm really looking forward to seeing Her this weekend. Curious about Wolf of Wall Street, but on the other hand I feel like Leo's getting typecast a bit too much lately.